Internationally recognised South African singer, songwriter, Yvonne Chaka Chaka has mentioned that, Ghanaian female musicians like Becca and Eshun are the artist she works with and will want to work with their type over and over again. In a presentation at the 5th All Africa Music Awards which is currently hosted in Ghana, Yvonne Chaka Chaka said Becca and Eshun are artist putting Africa on the world map and she is much grateful for the young artist efforts in the African Music Industry. 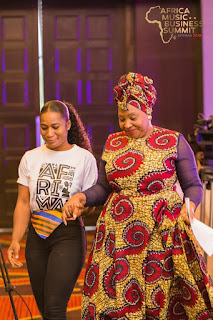 “I like to encourage young artist and I must say, artist like Becca and Eshun from Ghana are good and they are the kind of artist I work with” Yvonne Chaka Chaka stated. Ghana was unveiled as the 5th AFRIMA Official Host Country by the AUC on September 5 at the African Union Headquarters in Addis Ababa, Ethiopia. Subsequently, the Republic of Ghana accepted the Official Host Country rights on Tuesday, September 11 during a media event held at the Kempinski Hotel, Gold Coast City Accra and attended by top Ghanaian government officials led by the Minister of Tourism, Arts and Culture, Ghana, Honourable Catherine Afeku.